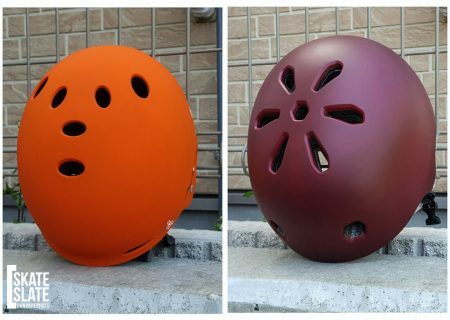 Since I’ve always been a helmet lover, this time around I wanted to compare two very good helmets. This time I reviewed the 「Japan Fit Meta TSG」 and the 「Switzer/Prader Signature Gotham」 from Triple Eight. Both of which I can confidently say are great helmets. Both helmet’s are certified which means there’s a very good chance that your brain is protected should you have a nasty crash. As well, both the Meta and the Gotham are great helmets for biking, riding scooter, striders, and of course skating. 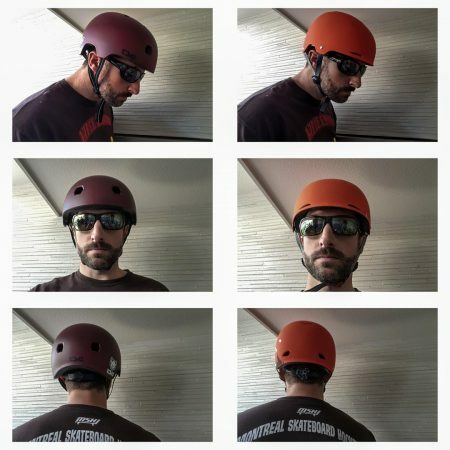 To start off I took a look at the profile of the helmets. 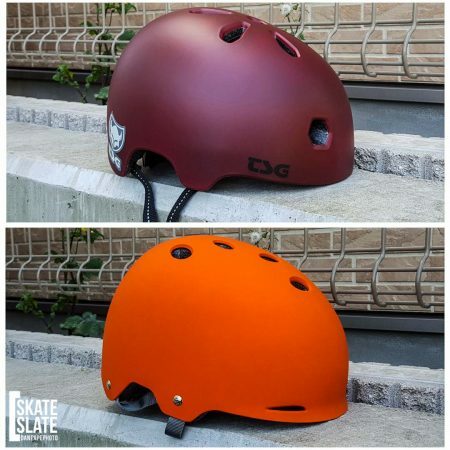 If you’re more into the classic skate helmet look then the TSG Meta is your lid. Some people like the small brim on the Gotham but again, it’s totally your preference. The overall size of the Meta is slightly larger. TSG was smart here though, they were able to keep the weight lighter than the Gotham. The weight difference is not that big so I doubt you’d even care once you get used to either one. As I said above, both helmets are certified which means they are impact tested. Basically, you never want to save money on your helmet. After all, this is your brain we are talking about. 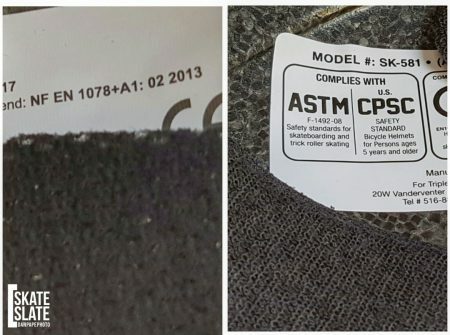 Always look for certification when shopping for helmets. I like what Triple Eight did with the subtle styling and graphics on the side. Although I am not a big fan of the bright orange version. I do however see the value of owning a bright coloured helmet. 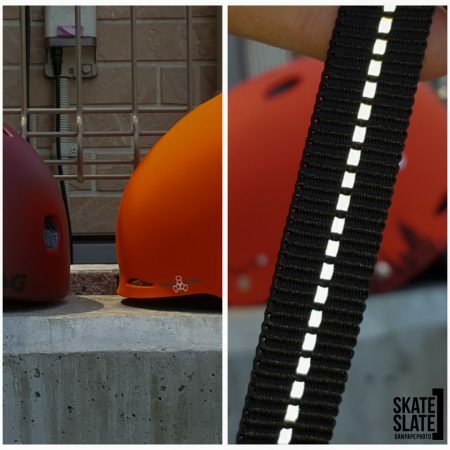 If you want to be visible while biking in traffic then the orange is good. The Gotham is available in White and Black as well. As for the Meta, SoyoRiding sent me the Ox Blood Satin Red which I am very happy with. I’m glad to see TSG making rad colours. If you don’t like this red, it’s also available in Blue, Black and White with stripes. 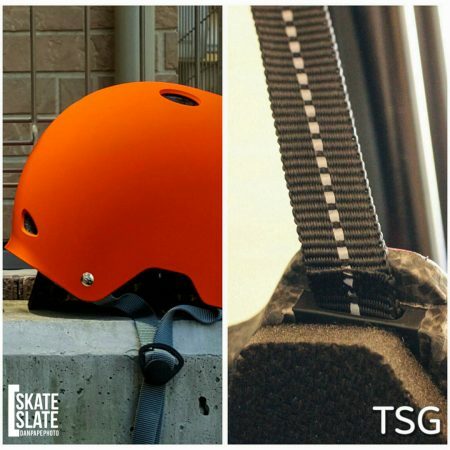 TSG took the safety one step further by integrating reflective straps. 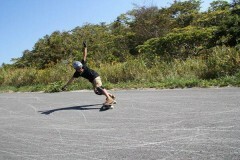 I really like this since I do so much night riding here in Japan. An area that Triple Eight beat TSG is the dial to adjust the fitting. 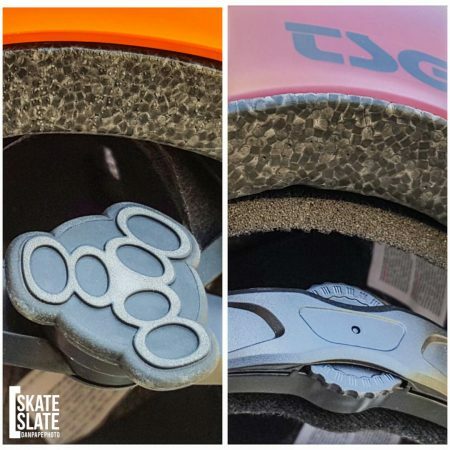 If you’re a skateboarder that uses slide gloves, it’s handy to be able to turn that dial with ease. I liked the mechanics and feel of the TSG dial better but that big dial on the Gotham gets a huge thumbs up. Here is a closer at the Side, Front and Rear profiles of the helmets. Another area these helmets are different are the way the straps are fixed to the helmet. I don’t feel one is necessarily better than the other so it boils down to preference. 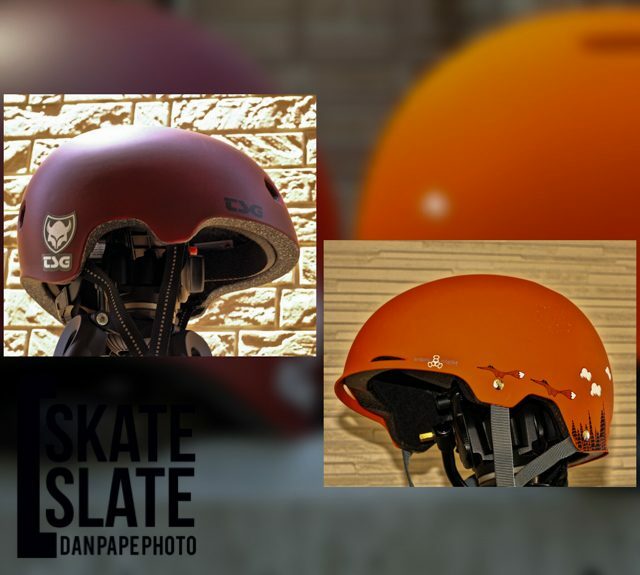 The Meta hides the rivets by attaching on the inside so it you like putting stickers on your helmets, than that’s always something to consider. 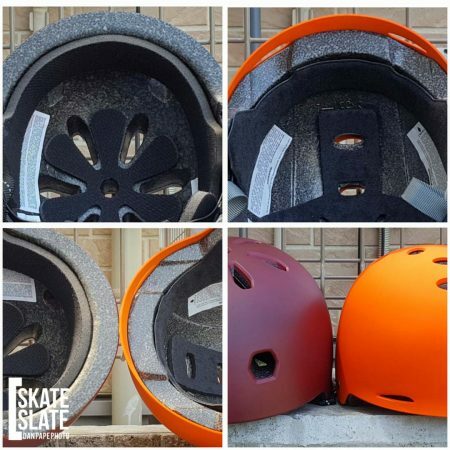 Venting – After testing both helmets in 25 degree weather I felt the Meta had better ventilation due to the big holes in the front. 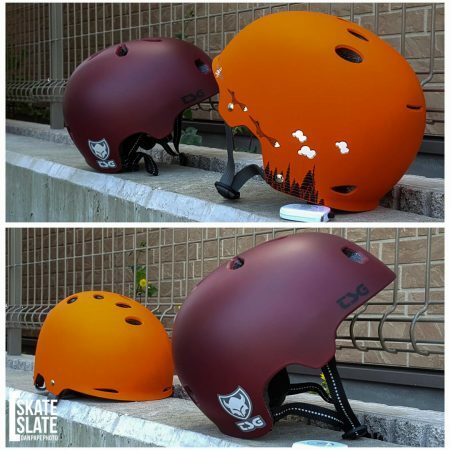 Triple Eight implemented their branding on the top of the helmet. After about 20 minutes in the sun I noticed to top of my head getting hot. When I was moving, there was a bit of air flow in the forehead area due to the small slits Triple Eight implemented in the design. In the Late Fall and Early Spring this may not even be noticeable. But if you get really hot, then you’ll definitely want to consider venting before you make your choice. 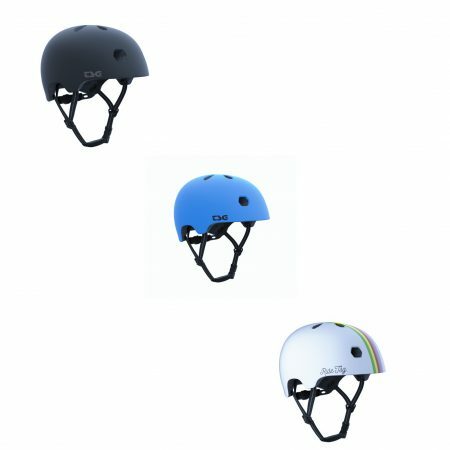 Construction and Padding – In this category these two helmets were very different. The Gotham has padding that is easy to throw in the washing machine. Although I’ve never had to wash or replace my pads, I do like this option of being able to wash them should you’re helmet get it’s stink on. I feel of the foam pads on the Meta are more comfortable but I wanted to add this. My last helmet was a Triple Eight helmet with similar a similar type of padding and it failed after a few years. The helmet was unwearable but it affected the comfort a little. Although the foam padding seems to be higher quality and not 2 layers (like my last helmet) , time will tell if the padding on the Meta will stand the test of time. The same goes for the Triple Eight Gotham, I’ve yet to discover how these padding systems will last after a few years. 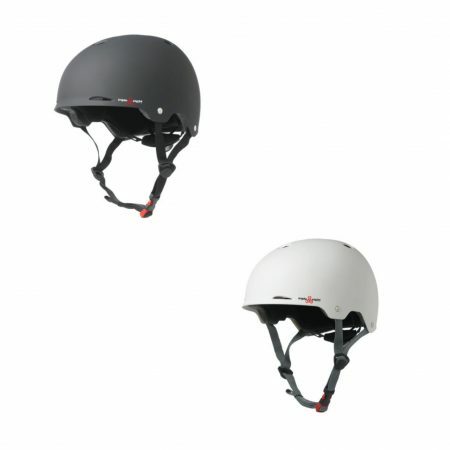 Initially though, both helmets are very comfortable. 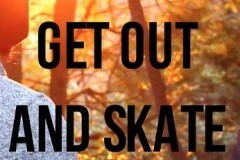 At the end of the day helmets are just like shoes. No matter what’s in style, they have got to be comfortable so you can wear them for hours and forget about it. Comfortable shoes, a nice safe helmet and slide gloves that keep you side-ways and in control are must haves. If you have kids, try to lead by example and make helmets fun. Sticker or draw on them, make it fun and you’re kids will pass it on for future generations. Important Tip – For me, the new 『TSG Japan Fit Meta』 was a little tight in the forehead. I simply loosened the dial and it was comfortable. 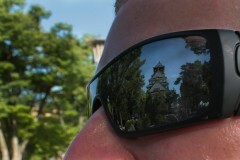 What is important to remember is that my head is shaped a lot different than most of my friends in here in Japan. I’m excited to announce this tip because the helmet will probably be MORE comfortable for my fellow riders here that have a head that is shaped different than mine. If you want to purchase the JAPAN FIT TSG Meta CLICK HERE while quantities last.